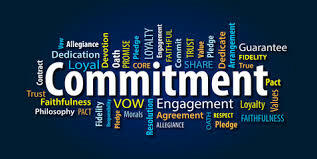 Commitment day has been around for years, because let’s be honest: what could deserve its own day more than the beautiful thing that is commitment? The first known Commitment Day was celebrated in 1960 as an extension of the tradition of New Year’s Resolutions. However, commitments are different from resolutions in that they are more often made to people. So they can benefit others as well as you! “I do”. Or “I will”. Even “I promise”. And “I vow”. Such lovely words… These words have long invoked sweet feelings of assurance and hopefulness. And have been used in marriage vows and such for likely just as long. There must be at least one person or issue in your life that deserves your commitment, your promise that you will fulfill. Maybe you’ve been dating the same person for years and years and have never asked him or her to tie the knot? If both people in the relationship feel that way, then making the decision not to get married is fine. However, if your significant other is the kind of person who longs for the romance of a wedding, even a small one. Maybe it’s time to take that sped in your relationship? You could also take this day to commit to an activity. Like finally starting that diet or yoga class and then sticking with it. The satisfaction you will get from knowing you are capable of making a lasting decision. One that will increase your self-confidence and the amount of satisfaction you get from life.